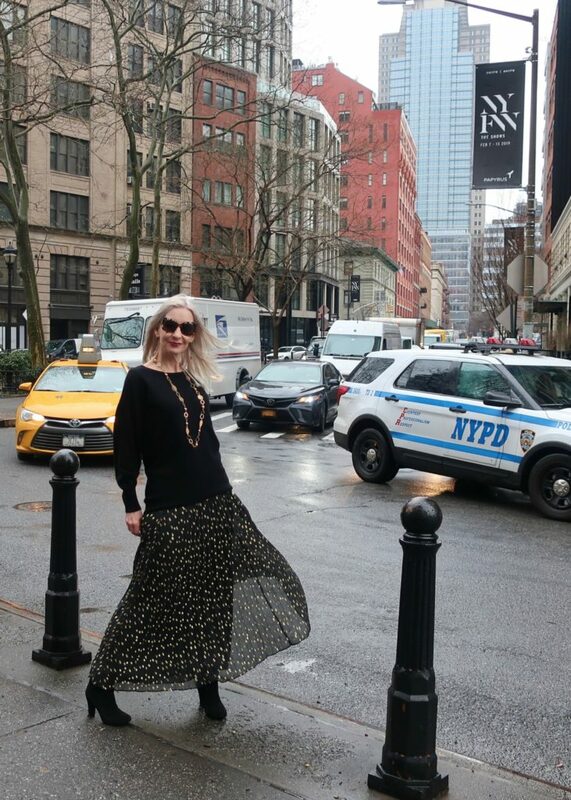 Chico’s Black Label collection is so luxe and fabulous that it fit right in at New York Fashion Week! This post is a collaboration with Chico’s, which my readers know is one of my favorite brands. I felt swanky and glamorous in this beautiful outfit from Chico’s Black Label collection. 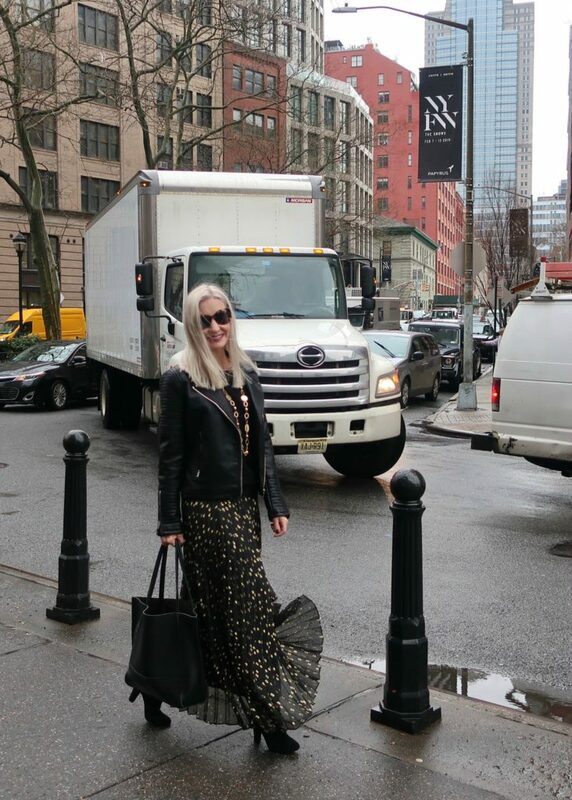 My blogging buddy Cathy of Bay Area Fashionista and I were sashaying around the Tribeca neighborhood of New York City in our pretty Chico’s outfits taking photos of each other and having a blast. We couldn’t find anyone to take our photo together though, which was a bummer. We did get a quick (and bad) iphone photo in a cafe at least. 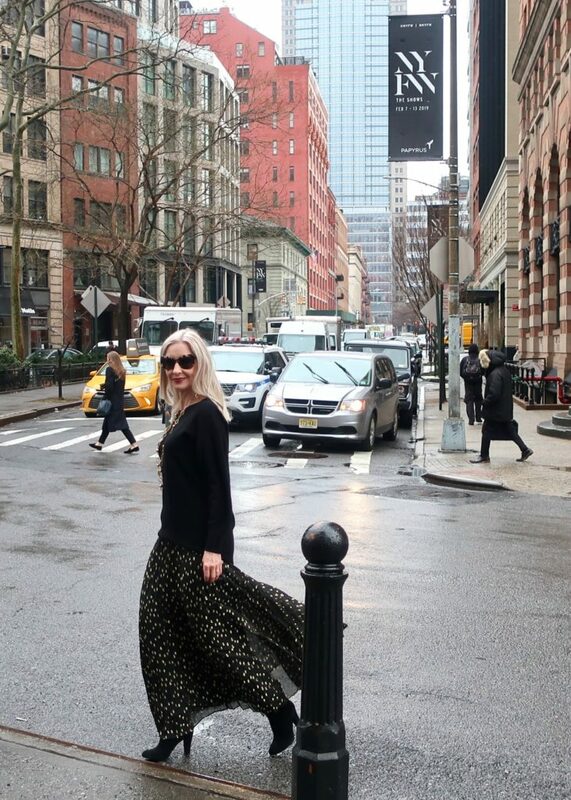 I was happy to get these photos with one of the NYFW signs in the background, along with the NYC street scene. The stunning gold shimmery embellishments on this sheer pleated fabric makes this skirt an instant eye-catcher. I love the way the skirt moves when I walk, and especially when I twirl! The A-line shape is super flattering too. This could be just the special skirt your wardrobe needs for many parties, celebrations, and date nights to come! Imagine a sweater so heavenly soft that you never want to take it off! This is a classic cashmere sweater with a bateau neckline and relaxed fit that you will be wearing for years to come. Wear with a fancy skirt, chic trousers, or even jeans, and it will always keep you warm and look luxurious and chic. And can you believe you it’s machine-washable? Chico’s knows how to make us happy, don’t they? The necklace and earrings (link to similar earrings, exact ones are sold out) are from Chico’s always trendy, always special jewelry collection. When you need special jewelry pieces to spice up your outfits, Chico’s bold jewelry collection is full of fab options. Notice I slipped on a moto jacket in that last shot? 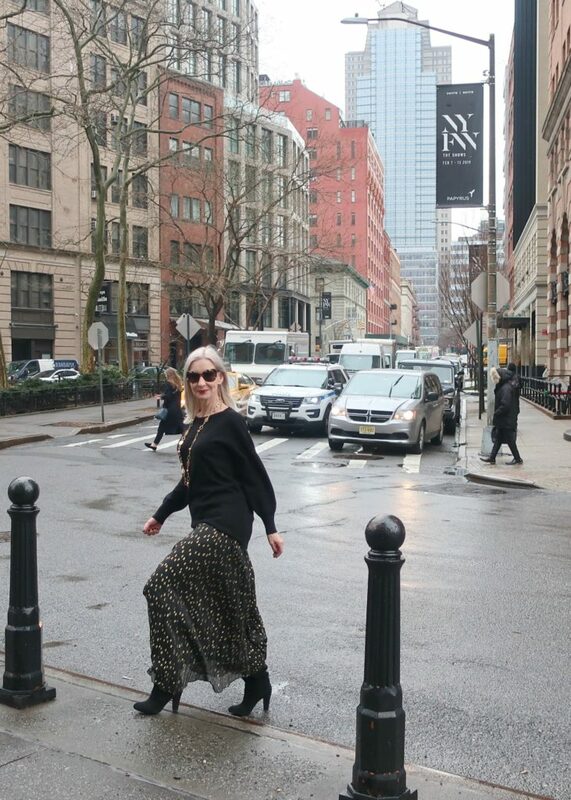 It was freezing cold, plus I liked the way to edgy moto played against the glamorous embellished skirt. Wouldn’t this outfit look great with a velvet blazer for a fancy party as well? Add a simple structured jacket for a more office-friendly look. From here, it was off to the shows and another exciting day at New York Fashion Week! From statement-making glam to comfy and casual, Chico’s always has you covered! If casual athleisure is more your vibe, be sure to check out my review of the Chico’s Zenergy collection. Chico’s has a collection for every part of a mature fashionista’s life.